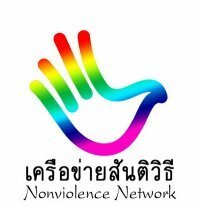 The Nonviolence Network urges all sides to stop killing one another and to stop the civil war. Stop sacrificing people’s lives for political gains. Where is Thailand heading? Right now, the situation of conflict, the violence and the use of arms from both the soldiers and the protesters have resulted in the loss of lives, as many as 17 people have died and more than 150 are injured. The violent confrontations are happening continuously and are likely to escalate. 1. For the government to withdraw military forces from all areas of conflict and for the UDD leaders to declare the end of the protest immediately, without conditions. 2. For all those disguised behind the scenes to stop hurting people and stop destroying our society for personal gains. 3. For all officials in the justice system to start collecting evidence that will lead to truth finding in all of the incidents. We believe that only truth sharing will lead to the reduction of conflict. Posted in Uncategorized, War and Peace and tagged Nonviolence, Thailand. Bookmark the permalink.